The Employment & Benefits group of Mayer Brown’s publishes- A Global Guide to Background Checks. Background checks are a critical part of the recruitment process. 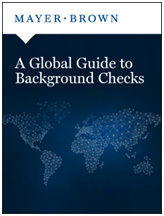 Employers with a global presence often seek to harmonize recruitment policies across different jurisdictions but addressing the many regulations around background checks can be challenging.A Global Guide to Background Checks provides an overview of both the legal and practical issues relating to background checks in 50 key countries. Our largest guide to date, it covers a wide range of background checks, from criminal record checks through to drug and alcohol testing, and identifies the applicable conditions, restrictions and sanctions in each country. It also incorporates new “at-a-glance” traffic lights for each region, highlighting whether background checks are standard practice, unusual or prohibited in a particular jurisdiction. A Global Guide to Background Checks provides an overview of both the legal and practical issues relating to background checks in 50 key countries. Our largest guide to date, it covers a wide range of background checks, from criminal record checks through to drug and alcohol testing, and identifies the applicable conditions, restrictions and sanctions in each country. It also incorporates new “at-a-glance” traffic lights for each region, highlighting whether background checks are standard practice, unusual or prohibited in a particular jurisdiction.